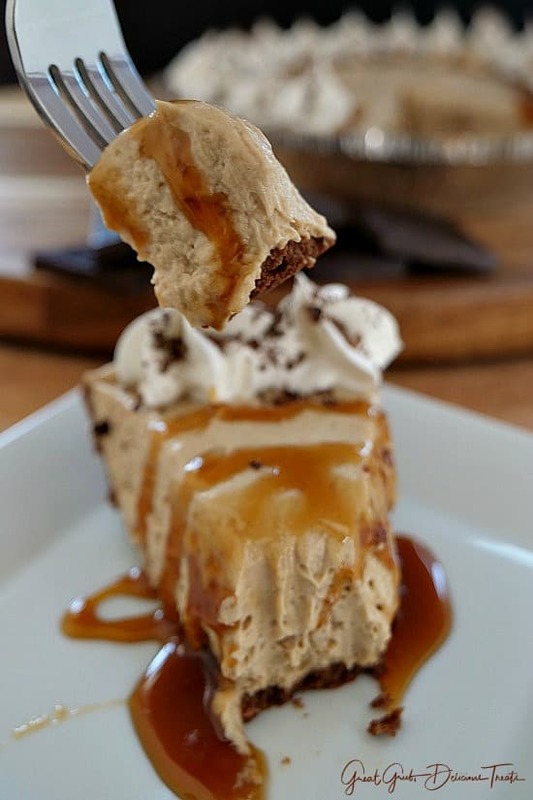 If you are a lover of coffee, and a lover of caramel, then you are going to love this no bake, creamy, coffee flavored, caramel macchiato cream cheese pie which takes about 15 minutes to make. I’m not kidding either. Seriously, this can be whipped up in no time at all. 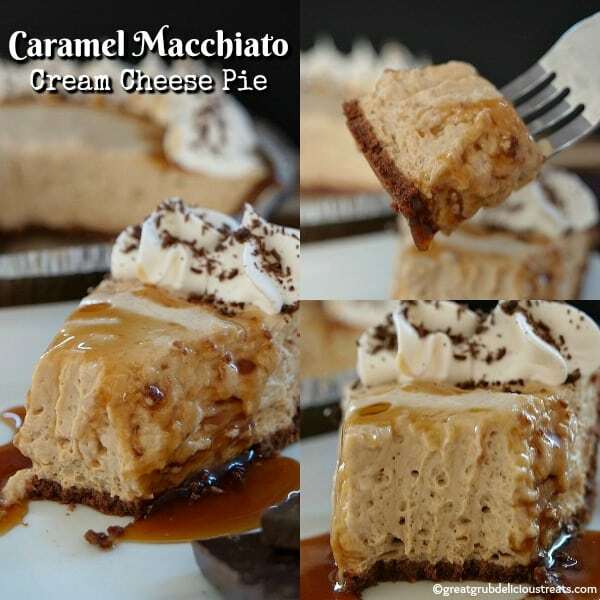 This caramel macchiato cream cheese pie is made just like my cream cheese lemonade pie except instead of using lemon pudding and lemon concentrate, we are using caramel macchiato pudding and actual brewed coffee in this super easy, no bake, pie recipe. 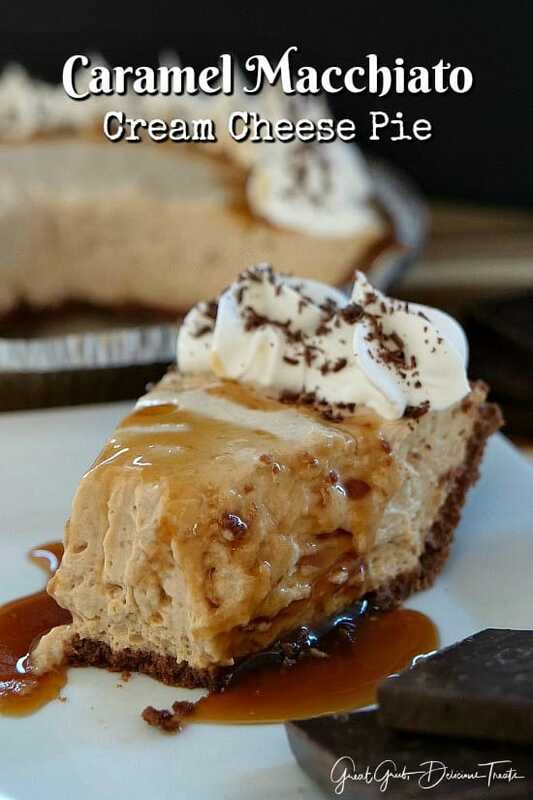 This is super creamy, has a delicious coffee flavor and is definitely not too sweet, packed into a chocolate graham cracker crust. The caramel drizzle and chocolate shavings are what adds the sweetness to this recipe. 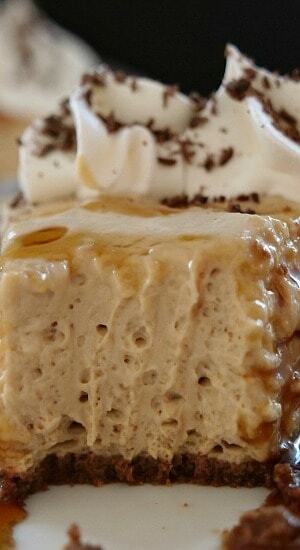 A rich, creamy, coffee flavor dessert that any coffee lover would love. 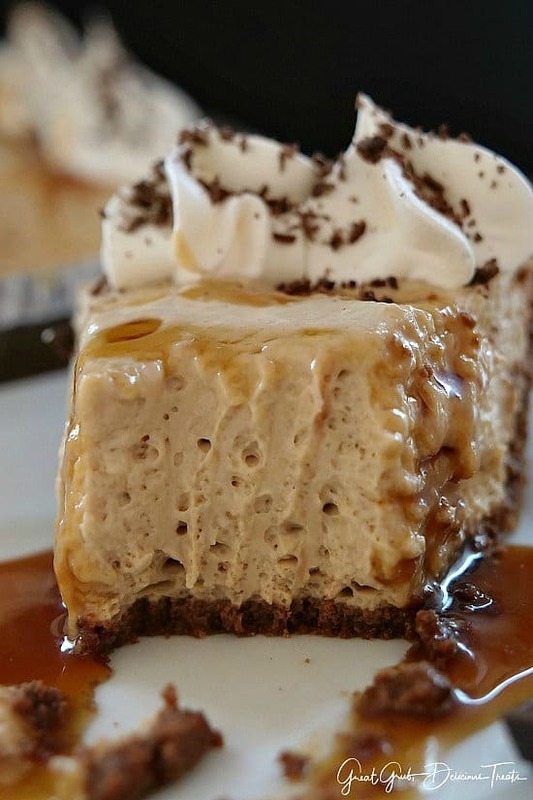 Two great flavors in one easy dessert – caramel and coffee – what could be better than that? 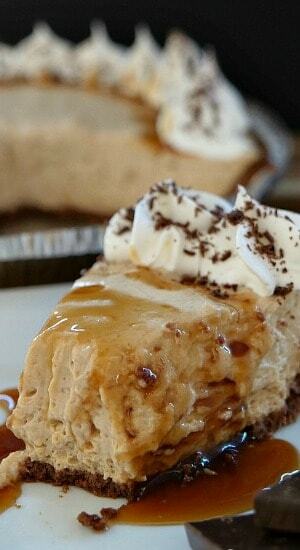 When making this pie mixture and adding the caramel pudding into the cream cheese, beat on low speed to incorporate. I did beat this on a higher speed and ended up with a lot of air pockets which created all these little bubbles. Still delicious and creamy, but next time I won’t be in such a hurry and I’ll remember to lower my speed. Here are a few more no bake cream cheese flavored pies that are on the blog. All of them tastes delicious and are perfect all year long and especially for the spring and summer season. The most popular dessert recipe on the blog, Cream Cheese Lemonade Pie, and how about an Orange Cream Cheese Pie, Cream Cheese Coconut Key Lime Pie, Chocolate Cream Cheese Pie or a Strawberry Cream Cheese Pie. All super easy, all super yummy. 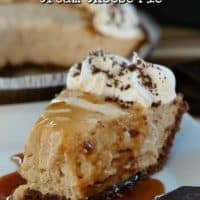 If you are a lover of coffee, and a love of caramel macchiato, then you are going to love this no bake pie. In a medium mixing bowl, beat cream cheese for about 3 minutes until creamy. Pour cooled coffee into cream cheese and beat for another minute. In another medium mixing bowl, beat pudding and evaporated milk together for 2 minutes or until pudding mixture becomes really thick. Spoon pudding mixture into cream cheese mixture, add vanilla and beat on low speed until incorporated. Spoon into pie crust, cover and place in fridge to chill for about 4 hours. Top with cool whip and shaved chocolate pieces. 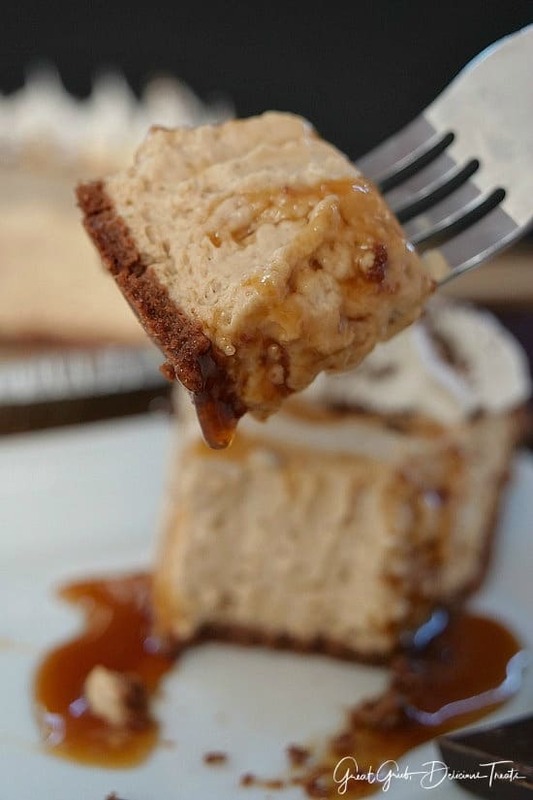 Drizzle with caramel sauce right before serving. Hi Sue, I bought it at Walmart. I hope you can find it there. It looks good but what if I cannot find the pudding; what can I use in place of the macchiato?